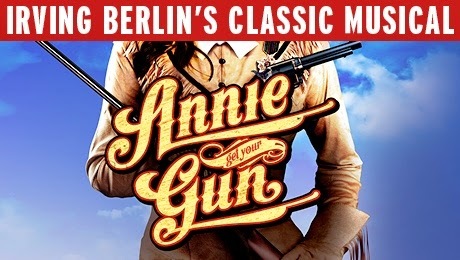 A brand new production of the Tony Award-winning version of Irving Berlin’s classic musical, Annie Get Your Gun, rides into Glasgow this September starring Emma Williams as Annie Oakley, Jason Donovan as Frank Butler and Norman Pace as Buffalo Bill. A star of stage and screen, and having performed on the musical theatre stage across the globe, Jason Donovan has appeared in hit musicals including Priscilla Queen of the Desert,The Sound of Music, War of the Worlds and Joseph and The Amazing Technicolour Dreamcoat. Now he will appear as Frank Butler in this new version of the classic Broadway smash hit. Jason is joined by Emma Williams as Annie Oakley. Emma is the twice Olivier nominated star of Chitty, Chitty, Bang Bang and Love Story. Her other credits includeSunset Boulevard and Sweeney Todd: The Demon Barber of Fleet Street. Jason and Emma will be joined by the much loved Norman Pace as Buffalo Bill, who most recently starred the West End production of Chicago. With timeless classic songs including There’s No Business Like Show Business andAnything You Can Do, I Can Do Better, Annie Get Your Gun tells the legendary story of Buffalo Bill’s Wild West female sharpshooter, Annie Oakley and her romance with fellow sharpshooter, Frank Butler. When Buffalo Bill’s Wild West show comes to town, it only takes one glance for sharp-shooting country girl Annie Oakley to fall head over heels for its star marksman, Frank Butler. Both have truly met their match, revealing their competitive natures as they vie for best shot – and each other’s hearts.